I’ve had this sitting in drafts for 6 months, partly because I was busy but partly because I was struggling with how to frame this material in the context of a blog about ATS belly dance. In ATS, as part of our performance makeup we often put markings on our faces that are inspired by facial tattooing traditions from other cultures, especially from North Africa. I can’t speak for any other dance groups, but the markings we use are our own creations — we’re not copying any of these traditions literally. But the markings in the ATS context is what brought me to be curious about traditional facial tattooing. I’m posting this material as one (geographically broad) example of an authentic facial tattooing tradition. It is emphatically not meant as a source for designs: the women discussed below have more or less uniformly asked that non-Inuit people (especially white folks) not “borrow” (aka steal) the tradition, especially during this nascent resurgence when it’s still a delicate thing — after having been suppressed for decades due to colonialism brought the view that anything that wasn’t Christian was evil. There’s a revival of Inuit tattooing (tunniit in Canada, kakiornerit in Greenland) going on, including striking facial tattoos for women. The traditional techniques for tattoos are the same as for stitching skins, and since women did the sewing, women were the ones who were skilled enough to do the tattooing. Women are leading the resurgence in traditional tattooing. Many different body parts may be tattooed, including fingers, hands, wrists, arms, chest, and back of neck. The hand decorations are vaguely similar to henna patterns, but the designs are made with dots and straight rather than curving lines. Tattoo designs are generally geometric. Encircling the thighs is another traditional place and this is associated with childbearing. In some communities, the tradition is that when a baby was born, the first thing it saw was something beautiful (“birthing marks”) to teach them that the world is a beautiful place. Chin tattoos are called tavlugun in Iñupiaq, talloquteq in Greenlandic language, and represent womanhood. The lines are vertical and may be parallel or may radiate outward at the bottom. Other designs include a V on the forehead, which may descend to between the eyebrows. This is called qaaq in Greenlandic for Maliina the sun, to shine and overcome. There may be dashes or dots in a line on the cheekbones, and/or a horizontal line at the temples. The meaning of tattoos varies among communities. Alethea always thought traditional tattoos were beautiful and set out to learn about them. She spoke to many Elders and collected their wisdom in her documentary, Tunniit: Retracing the Lines of Inuit Tattoos. 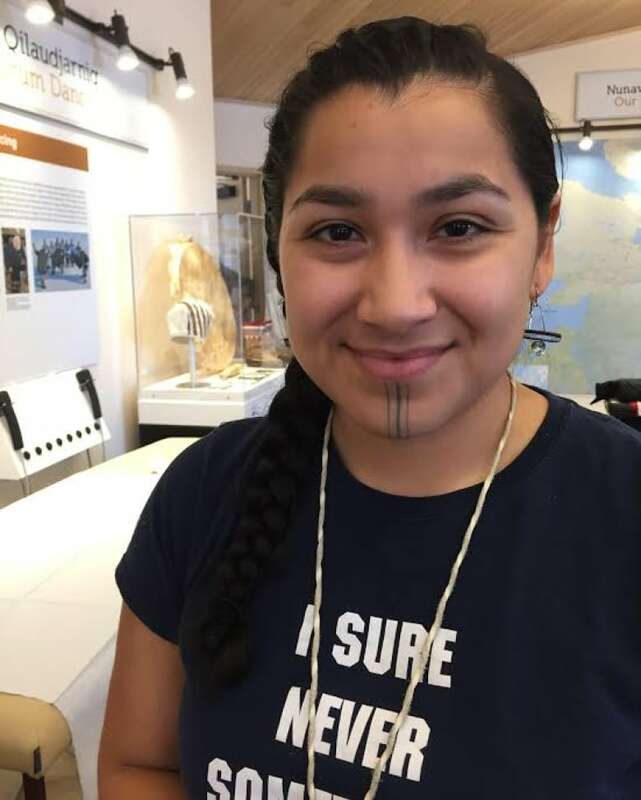 When Marjorie Kunaq Tahbone, of Nome, Alaska (Iñupiaq, Kiowa) graduated from University of Alaska Fairbanks with a degree in Iñupiaq language and Alaska Native Studies, she marked the occasion by getting three black vertical lines tattooed on her chin (using a modern tattoo gun). It’s a traditional tattoo symbolizing womanhood and a coming of age. After seeing a photo of Kunaq online, Elle Festin, a Filipino-born traditional tattoo artist in LA, reached out to her and offered to teach her the traditional tattooing methods that he had learned. In August 2015 Kunaq flew to LA, where he taught her skin stitching and hand-poke aka stick-and-poke techniques. 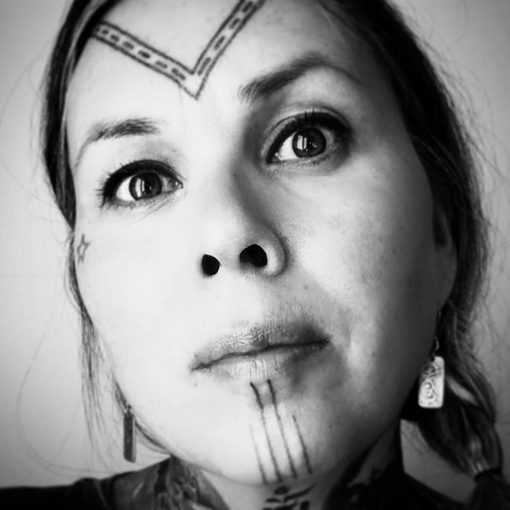 Kunaq now has a Master’s degree in Cross-Cultural Studies (2017), having written her thesis on traditional Inuit tattooing. She plans to get a PhD. Angela Hovak Johnston, originally from Kugluktuk NU but now based in Yellowknife NWT, tattoos using a tattoo machine, as well as the traditional stitch and poke techniques, which she learned from Marjorie. Hovak has created the Inuit Tattoo Revitalization Project and has travelled to a few communities in the north to help local women get the tattoos and revive the practice. Hovak also has a book out, Reawakening Our Ancestors’ Lines: Revitalizing Inuit Traditional Tattooing, which won the NorthWords Book of the Year prize 2018. Maya was born in Denmark to a Greenlandic mother and a Danish father and moved to Greenland as a child. As an adult she became a tattooist using a standard mechanical tattoo gun but eventually found it too difficult to use with her fibromyalgia. Then she started working in traditional techniques. Maya documents her work on her Facebook page, Inuit Tattoo Traditions, and on Instagram (@maya_sialuk). She’s done a great deal of research into the traditional designs, which do not survive in living memory in Greenland (though they do in the Canadian Arctic and Alaska), in an effort to give the patterns back to the people to whom they belong. This workshop will focus on the basic arm positions in American Tribal Style® belly dance; how they’re related to each other; and what moves they’re found in. We’ll look at details of elbow, forearm and hand posture; the back muscles that are involved, and how hand movements interact with the basic positions. This workshop is for those with some experience with ATS or tribal style belly dance. Space is limited, so please register in advance to reserve your spot via the Contact page. Preferred payment method is e-transfer. Bring finger cymbals if you have them. A great place to start a jewelry collection. ATS costume has a rich, generous look to it, but collecting the pieces to create the look can feel overwhelming, and it can be a serious investment. As exciting as some of the big, authentic pieces can be, they aren’t the best place to start a jewelry collection. The bracelets are hollow construction and thus very light, which is a virtue – especially by the end of a performance when you feel like your arms are about to fall off. I bought these ones new for I think $5 each at Ten Thousand Villages, a store that sells fair trade handicrafts from around the world. Made in India, they’re a really great basic item and I wish I’d gotten more, but it took me a while to learn the “more is more” lesson. Also, I hadn’t figured out my style yet and it was just as likely that I’d wear them once and never again. The (nickel silver?) plating is wearing off a little on the edges, but that lived-in texture and sense of personal history is entirely appropriate here. Newness, polish and modernity just doesn’t suit the aesthetic. bangle – noun. 1. a rigid, ring-shaped bracelet usually made without a clasp so as to slip over the hand, but sometimes having a hinged opening and a clasp. Too much is probably not enough. The first time I performed ATS, I got kitted out in the choli, pantaloons, skirt, and headdress I had recently made, decked myself in all my jewelry, and caked on the makeup. My day-to-day aesthetic had always been understated and I now felt awkward and completely overdressed and overdone. Until I got to the performance venue. When I saw what my fellow dancers were wearing, I had to revise my self-perception: I was, in comparison, underdressed and under made-up. Such is the way of ATS costuming: (what feels like) too much is probably not enough. At least for me. Troupe costumes tend to relate to each other without coming close to being identical. I’d go so far to say that the ATS aesthetic generally rejects mass produced items because they tend to lack character. Part of the joy in creating your costume is celebrating the individuality of items made by hand rather than by a machine. You express your personality when you choose (buy, make) your costume pieces. If you have too many pieces to wear them all at once, you express your creativity in the way you curate and display your collection for the day’s performance. After my first performance, I began my collection in earnest. I enjoy the costuming aspect of ATS, so I’ll be sharing some of my costume pieces here on the blog. I hope to provide some inspiration and information. And even if this is all old hat to you, it’s still fun to peek inside someone else’s costume closet, don’t you think? American Tribal Style® (or ATS®) looks old but is actually new, having been created by Carolena Nericcio (now Nericcio-Bohlman) in 1987. The music, movements and costume come together to create a rich and vibrant look that, despite appearances, doesn’t belong to any traditional culture. ATS is a pastiche of traditional elements, unified and embellished with modern creativity, assembled in the USA a mere 30 years ago and still developing. Author ZenaPosted on September 12, 2017 Categories UncategorizedTags American Tribal Style, ATS, belly dance, bellydance, danceLeave a comment on What is American Tribal Style® Belly Dance? Zena Snow Dance A WordPress.com Website.